A Scott plaque at Chatham, Kent. Episodes: 3 & 31. Site Number: 129. Date Posted: 16 April 1996. 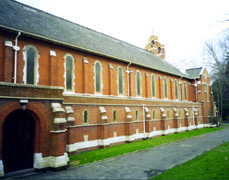 Location: St. George's Church (now St. George's Centre), Chatham Maritime, Gillingham, Kent, England. Type: Plaque. 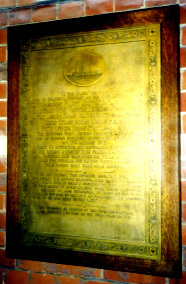 In the west end of St. George's Church, Royal Naval Barracks, Chatham, Kent, is a brass tablet bearing an inscription surmounted by a picture of Robert Scott's ship the Terra Nova. The words of Captain Scott's farewell message are also engraved upon the tablet. The memorial was dedicated by Archdeacon H. S. Wood, Chaplain of the Fleet." Source: Archives of the Scott Polar Research Institute. I've not seen the plaque; any first-hand accounts or comments on its presence/condition would be appreciated. To the Glory of God and in grateful memory of the life and death of Captain Robert Falcon Scott C.V.O. Royal Navy. Lieutenant Henry Robertson Bowers, Royal Indian Marine. Captain Lawrence Edward Grace Oates, 6th Inniskilling Dragoons. Doctor Edward Adrian Wilson, MA, MB. Petty Officer Edgar Evans, Royal Navy. The Southern Party British Antarctic Expedition reached the South Pole on 17th January 1912. Beset by misfortunes and abnormally bad weather, meeting death with fortitude and calm heroism. Their bodies rest amid the eternal ice of the South Antarctic. Their deeds have made them immortal. "I do not regret this journey which has shown that Englishmen can endure hardship, help one another, and meet death with as great a fortitude as ever in the past. We took risks, we knew we took them, things have come out against us and therefore we have no cause for complaint but bow to the will of PROVIDENCE, determined still to do our duty to the last." This memorial is erected by the Commander in Chief, the Officers and Men of the Nore Command 1913. [Outside the decorative border and on the right hand side is the inscription:] F. Osborne & Co Ltd London W.